UPDATE: With respect to terminology, check out Drew Neil’s comment below. However, I’ve been using the subset of splits that I understood while shying away from advanced use cases. Somewhere down my TODO list, there was an item called “understand Vim splits”. This blog post is an attempt to document what I discovered. are you splitting the buffer or the window? are you splitting horizontal or vertical? do you want to send the split left, right, up or down? 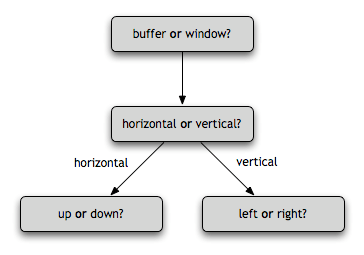 You are using the defaults: buffer, horizontal, up. Even though I spent a few hours thinking about splits and studying the commands to eventually come up with that summary graph, I can’t say it’s the most intuitive set of commands around. If I stop everything I’m doing, I can mentally come up with the right command but it’s very taxing. Feel free to replace the arrow keys (up, down, left, right) with k, j, h, l if you’re more comfortable with those bindings.